Despite damp, cool weather several charters went offshore today. Everyone has been waiting patiently for the chance to get out - maybe for some tuna. 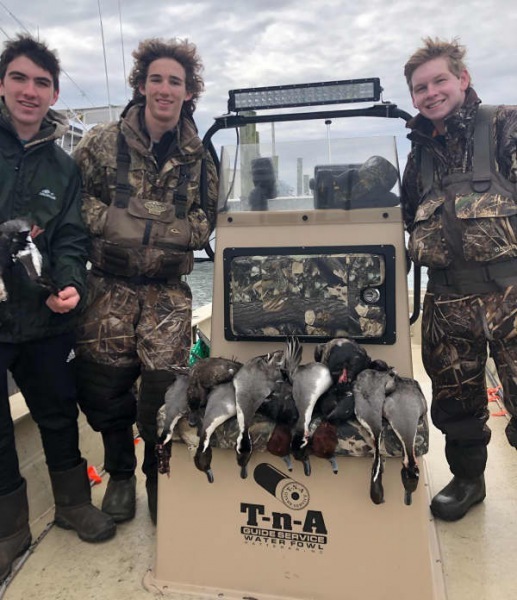 They experienced a good Blackfin Tuna bite along with a fair Yellowfin Tuna bite. 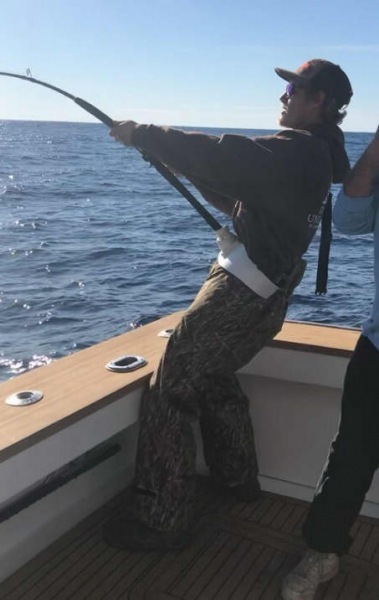 Once again we had some winter Dolphin bites (gaffers) and a lone Wahoo was hooked by one party. All in all a good day with anglers returning with fish and lots of smiling faces! Creighton Hostelka of Colonial Beach, VA: 30 lb. Blackfin Tuna on Release. Robert Hostelka of Colonial Beach, VA: 22 lb. Blackfin Tuna on Release. Daniel Micec of Fredericksburg, VA: 28 lb. Blackfin Tuna on Release. Randy Gribbell of Gould City, MI: 26 lb. Blackfin Tuna on Calypso. Temps were fair into the mid 50's. Thunderstorms moved in later afternoon. A couple of boats were out fishing today they found Yellowfin and Blackfin Tuna as well as some Amberjack. What began as a cold, gray morning ended up being a much warmer sunny afternoon. 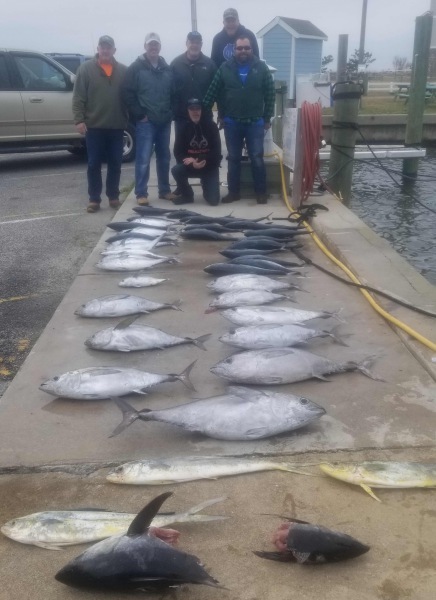 A couple of offshore charters headed out today and they managed to bring back a few Blackfin Tuna, however the bite was pretty slow. A few are planning to get back out this week, so keep an eye on our daily report and we'll let you know what's happening. March is a great time to visit - give us a call at 800-676-4939 for bookings for charters and accomodations. Weather was pushing 60 as the day started out but dropped in the late afternoon. One boat out fishing caught a dock full of Triggerfish, a few Sea Bass and a Blackfin Tuna. Beautiful sunny day with light winds and temps in the 50's. One boat out fishing today they reported a great Blackfin Tuna bite as well as Amberjack and Sea Bass. 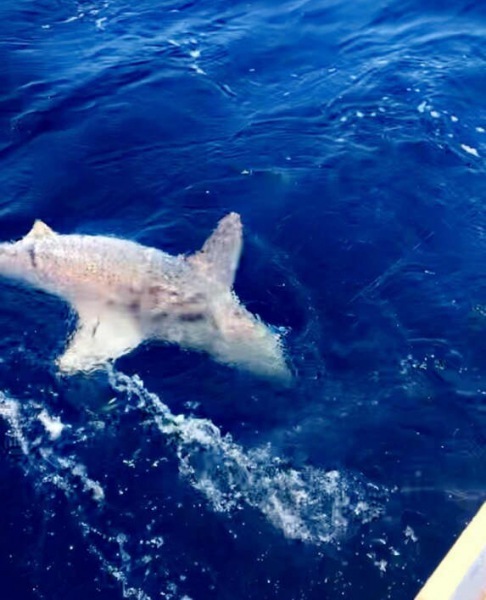 If you like Shark fishing today would have been a great day as well. Sharks were in pursuit of Tuna as well. 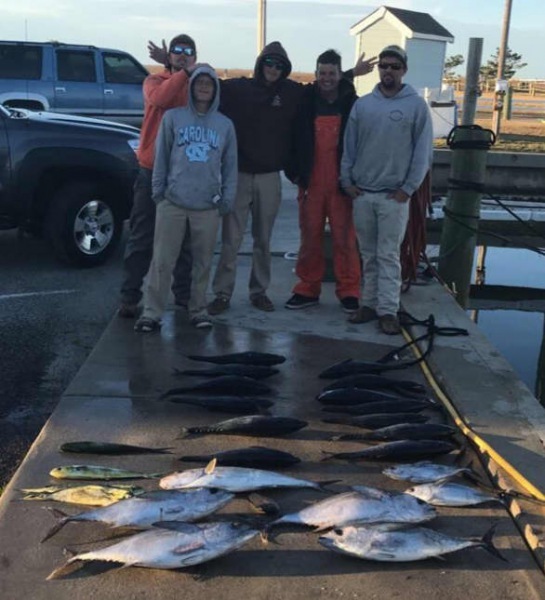 We had one party to fish offshore today. They enjoyed a beautiful day with mild temperature and lots of fog. 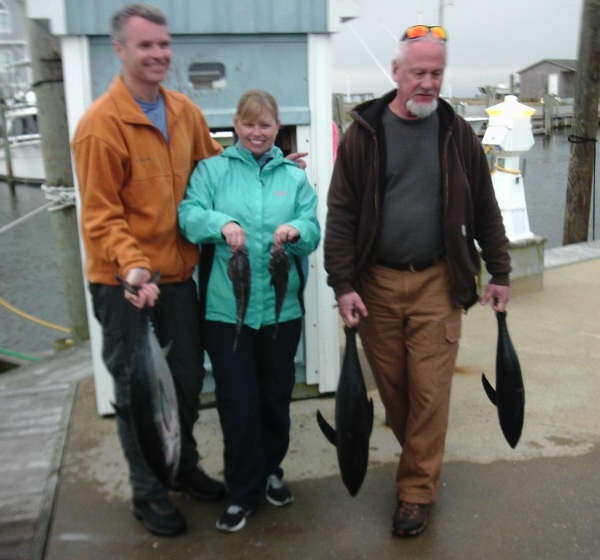 They returned with a good catch of Blackfin Tuna along with some Black Sea Bass. It's a wonderful time to visit the Outer Banks - lots of nature to observe all around whether on land or sea! Give us a call at 800-676-4939 and we'll hook you up with a fishing excursion. A few boats out fishing today. 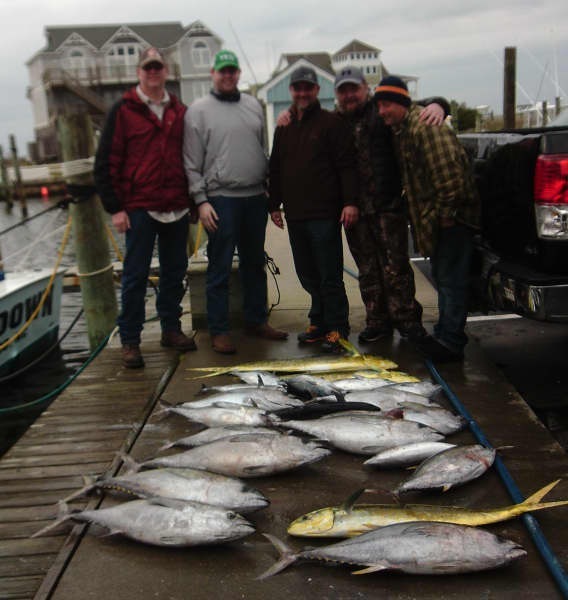 They caught fair Blackfin Tuna and a few Mahi. Albacore were also on the hook, but a lot of fish were taken by sharks before they made it to the boat. Carolina Girl: Brian Connolly of Fredericksburg, VA caught a 24lb Blackfin Tuna. 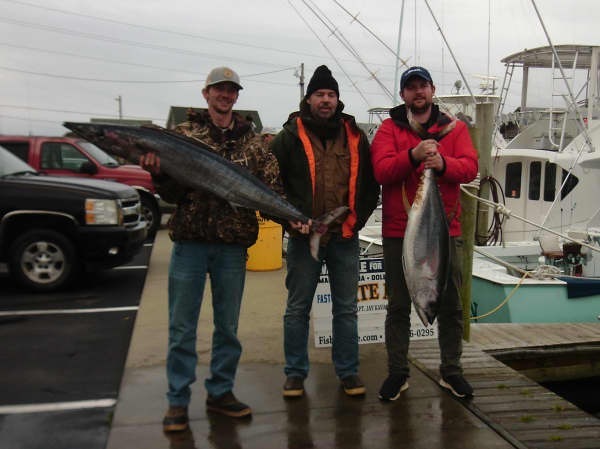 Michael Kelly of Powhtan, Va caught a 27lb Blackfin Tuna. Happy Valentine's Day to everyone! We had one charter to go offshore on this beautiful February day - lots of sunshine and a Northwest breeze. They experienced some excitement as Sharks were providing lots of action. A good catch of Blackfin Tuna and a few lost Dolphin made it into the fish box which made their day. Enjoy the good eats! Timothy Dail of Elizabeth City, NC: 400 lb. Shark release on Carolina Girl. One boat ventured out on this cold rainy day. 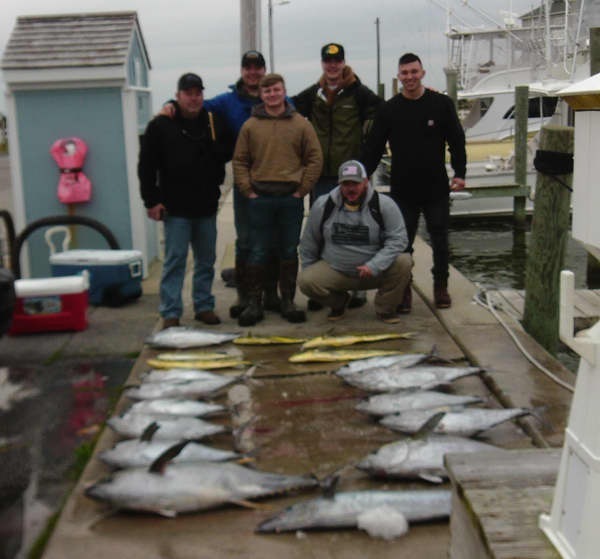 They caught a few Blackfin Tuna, Mahi and a scattering of Sea Bass. 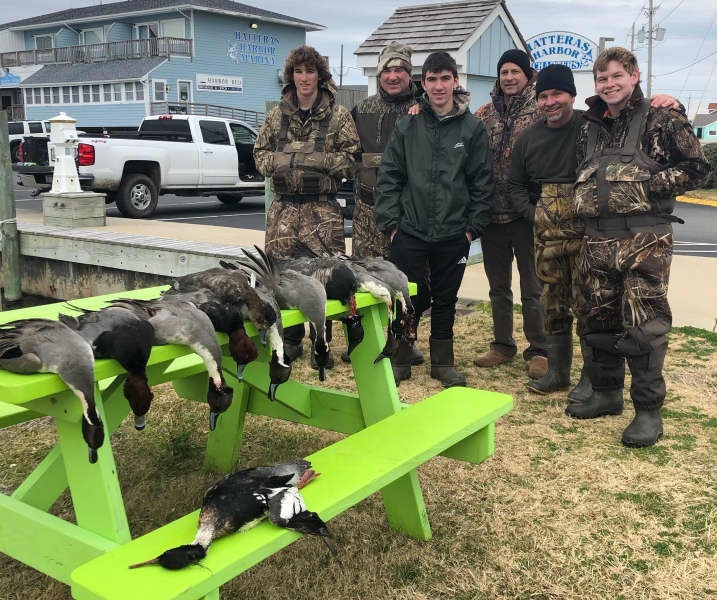 We had a few hardy young men who took advantage of Youth Day and ventured out with a couple of our duck hunting guides this morning. They had a great experience and demonstrated excellent sportsmanship skills. Pictured are Worth, Logan, Fleet, and Ross. Check out the smiles in the pictures!